26 cm 140 p. : col. ill. Contemporary artists investigate the boundaries between animal and human in a world of transgenics and dissolving distinctions; with 65 colour images of new works. In an age when scientists say they can no longer specify the exact difference between human and animal, living and dead, many contemporary artists have chosen to use animals in their work - as the ultimate "other," as metaphor, as reflection. The attempt to discover what is animal, not surprisingly, leads to a greater understanding of what it means to be human. In Becoming Animal, 12 internationally known artists investigate the shifting boundaries between animal and human. Their explorations may be a barometer of things to come. 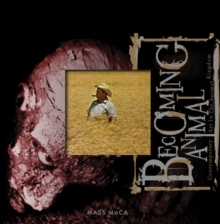 The works included in Becoming Animal - which accompanies an exhibit at MASS MoCA - range from the aviary and cabinet of curiosities of Mark Dion to the gun-toting bird collages of Michael Oatman. Nicolas Lampert's machine-animal collages and Jane Alexander's corpse-like humanoids suggest a new landscape of alienation.Rachel Berwick's investigation of the last Galapagos tortoise from the island of Pinto and Brian Conley's humanised mating call of the Tungara frog question the divide between human and animal communication. Patricia Piccinini imagines a bodyguard for a bird on the edge of extinction and Ann-Sofi Siden recreates the bedroom - and paranoia - of psychologist Alice Fabian. Natalie Jeremijenko presents another instalment in her ongoing Ooz, reverse-engineering the zoo, and Kathy High's installation of "trans-animals" remembers lab rats who have given their lives for science. Sam Easterson's videos allow us to see from the viewpoint of an aardvark, a tarantula, a tumbleweed; Motohiko Odani's films show a surrealistic genetically modified bestiary. Becoming Animal documents these works with eye-popping full-colour images, taking us on a visual journey through an unknown world.